Save Our SBS Inc is a not-for-profit, incorporated association. We are members of the public who appreciate the unique and important role which SBS plays that has reflected and enriched Australia’s multicultural society. We care passionately about SBS. As a stakeholder in SBS we are part of the SBS Ambassador program however remain independent of SBS. Sometimes we agree with SBS and at other times disagree. (h) genuine in its consultations with ethnic, Indigenous and other Australian communities. (2) For the SBS Board to be appointed – through a ‘arms at length from government’ process – based on merit, consisting of people with a strong commitment to multiculturalism. (3) For the Association to exist for its members as a friend and supporter of the SBS but in pursuit of these purposes, and for the Association without fear or favour express constructive analysis or criticism of the SBS or its views and actions, where in the opinion of the Association, the SBS deviates from its original special purpose or for any other reason. (4) To lead community debate and represent community views – that are broadly in agreement with those of the Association – to the SBS, government, parliament, organisations and other bodies or persons. (5) To do such other things to further the funds and assets of the Association. (6) To carry out activities with or without like minded persons or organisations (incorporated or not) which may further the advancement of the Association for these and related purposes. Prior to 2008 Save Our SBS was an unincorporated club but public support for our activities created the need to adopt a more formal structure and in early 2008 Save Our SBS became an Incorporated Association under the Associations Incorporation Act 1981, then operating under the (old) Model Rules. That Act was repealed in 2012 and for a period, (newer) Model Rules applied. Today we operate under the Associations Incorporation Reform Act 2012 and the Associations Incorporation Reform Regulations 2012. The current Save Our SBS Inc Rules 2013 (as amended 2016) are registered with, and approved by, Consumer Affairs Victoria. We are strictly a not-for-profit organisation in accordance with the Act and Regulations. We have national registration and as a Registrable Australian Body. There are no shareholders nor directors being paid a dividend or the like. At law, that is not allowed. No member is benefiting financially from our activities. Quite the opposite in fact. Our operation depends entirely on the support of active participants. We have had a good working relationship with SBS. We have made many formal submissions to government for SBS to be better funded. We often meet with politicians and their advisors from all sides. We involve the wider community from time to time in public campaigns in support of SBS. In 2007 some 1,119 people emailed politicians seeking more funding for SBS and legislative change to end disruptions into programs on SBS television. In 2008 more than 7,500 people signed a petition to the Minister requesting an end to the disruptions into programs by an amendment to the SBS Act coupled with full funding for the SBS. In a small on-line study we conducted when SBS had been interrupting all television programs for just on two years, 96.3 percent of the 1,733 participants said they wanted “SBS-TV to stop interrupting programs for commercial breaks” and 95.9 percent said they wanted “government to legislate to prevent programs from being interrupted on SBS-TV”. In 2008, more than one-thousand public submissions were made to the DBCDE ABC SBS Review. Of those that commented on the SBS only, almost all expressed the view of wanting the government to legislate to prohibit SBS from interrupting programs for commercial breaks. By 2010 more than 15,400 had directly asked their parliamentarians to increase public funding for SBS so that it would be free from advertising, to amend the SBS Act accordingly, saying – an investment in SBS would be an investment in Australia’s future cultural diversity. Just before the 2012 May Budget we ran the shortest on-line campaign ever where some 9,171 messages were sent from ordinary people in every State and Territory to selected politicians urging government to steeply increase public funding for SBS and remove the disruptive commercial breaks from SBS television. Subsequently, SBS received the biggest funding increase ever – 27% over four years – but the adverts remained. In 2013 Save Our SBS submitted a 102-page evidenced based report to SBS titled A study of 2044 viewers of SBS television on advertising, Charter, relevance and other matters which found that 92% of SBS viewers believed “most in-program advertising breaks look forced or artificially contrived and it would be misleading to describe these as natural program breaks”, and three-quarters said that “since SBS-TV introduced in-program advertising, [SBS was] less faithful to the Charter now than it used to be”. In response to government threats of massive funding cuts to our national multicultural broadcaster, in 2014 Save Our SBS organised a very successful public campaign that averted cuts in the order of $40m to $60m per annum to be watered down to $2m. In 2015 funding to SBS was cut by one percent per year for five years and a Bill introduced to formalise product placement and increase advertising on SBS to similar levels seen on commercial television. The Liberal-National Coalition government Bill – supported by SBS – if passed would have put advertisers before the SBS Charter to the detriment of the audience. Save Our SBS with Margaret Pomeranz & Quentin Dempster in partnership with GetUp gathered 62,000 signatures on our ‘Preserve its Integrity! Don’t Increase Ads on SBS‘ petition objecting to the further commercialisation of SBS. Save Our SBS submitted ‘The commercialisation of SBS versus efficiency‘ in evidence before a Senate Committee. We also lobbied Labor, Greens and key senate crossbenches to vote against the Bill. It was defeated in the Senate thus preventing more primetime advertising on SBS. In 2017 the Liberal-National Coalition government reintroduced the same Bill that was voted down in 2015 to formalise product placement and double the hourly advertising limit on SBS. However, as a direct result of the 2017 Save Our SBS & Mary Kostakidis campaign titled ‘Preserve our media diversity: Don’t turn SBS into Australia’s fourth commercial TV network‘ in which more than 10,000 SBS viewers emailed their local Member of Parliament and Senators, the Government withdrew the Bill within two weeks of our campaign commencing. It was never put to a vote. The Prime Minister issued this statement: "Following community feedback and discussions with industry stakeholders, the Government has decided not to proceed with the legislation. This legislation will now be withdrawn from Parliament." The Government’s back down was largely due to the effective lobbying of Save Our SBS and supporters. By any measure there remains a ground swell of electors who do not want advertising on SBS and want programs presented the way the Parliament intended; uninterrupted without in-program commercial breaks. Save Our SBS favours programs in languages other than English (LOTE) and applauded SBS in adopting a social inclusion policy. Save Our SBS was formed in January 2007 by a group of loyal supporters of SBS-TV, concerned that the then introduction of commercial breaks within programs and commercialisation of SBS was out of step with community concerns, against the spirit of public broadcasting and a threat to the continued enrichment of multilingual and multicultural broadcasting that had distinguished SBS from other media. Although independent in our own right, over the years we have worked with various bodies that have similar aims and interests to ours but never been a member of, nor beholden to, any political party, politician, lobby group, union, organisation or person. Why do viewers want programs without disruptions? In late 2006, without public consultation, SBS-TV began interrupting programs for commercial breaks. That was a fundamental departure from its past practice of screening advertisements between programs only. Commercial and promo break disruptions into program are annoying and not natural. Many breaks now appear forced. SBS maintains all breaks are natural and therefore permitted under the SBS Act 1991. Either way, the interruptions disregard the viewer experience and destroy program integrity. Many have argued that the decision to position advertisements breaks within every television program – including those not delivered in broken format – may be unlawful, however SBS’s decision has never been tested in a court. Such disruptions are not part of the SBS Charter. SBS is a tax payer funded public broadcaster without public support for continued disruptive in-program breaks and it ought not be mimicking commercial television. The need to appease advertisers seeking to maximise audiences affected SBS programming. Until the introduction of in-program disruptions, the character of the SBS was highly regarded as unique being the first multicultural broadcaster anywhere. It was admired around the world. Financially, post 2010, SBS suffered as the revenue growth from television advertising was negative with a slight increase in 2013 compared to 2006 and the preceding years when SBS limited advertising to between programs rather than in them. Even though SBS may now prefer an increase in government funding in lieu of advertising, the SBS experience has demonstrated that once the commercial foot is in the door its presence grows but proportionally revenue may slow. No government has offered extra funding to restrict advertisements to between programs only. Without disruptive in-program commercial breaks, the distinction that once separated SBS television, and On Demand catch-up services from commercial Networks, would again be realised. The longer term financial security of SBS would be clearer allowing it to resume its rightful place as a special and unique multicultural broadcaster no longer subject to juggling audience with advertisers. 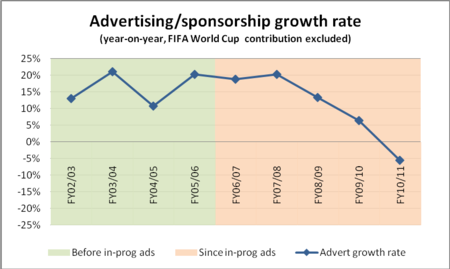 A chronology of advertising on SBS by Darce Cassidy documents the history of the slippery slope from non-commercial to commercial (up to 2008). Anyone can subscribe free of charge to the Save Our SBS occasional eNewsLetter at https://saveoursbs.org/lists/?p=subscribe, regularly visit SaveOurSBS.org or subscribe via our free syndicated RSS feed at https://saveoursbs.org/feed displaying stories (posts) and https://saveoursbs.org/comments/feed displaying comments (feedback). Save Our SBS is sometimes referred to as SaveOurSBS.org or SOSBS. Our full name is Save Our SBS Incorporated. SaveOurSBS.org.au redirects to SaveOurSBS.org which is the official web site of Save Our SBS Inc. The URL SaveOurSBS.org is viewer friendly on both desktop and mobile devices with the mobile site displaying pages in a simpler and different format from the desktop version. Web browsers – desktop or mobile – should detect and auto switch the correct SaveOurSBS.org feed. However, a forced switch may sometimes be possible by clearing the browser’s cookies, cache, history and data. The above may be useful for browsers that display an undesired feed.